Chevy Volt on display in 2011. 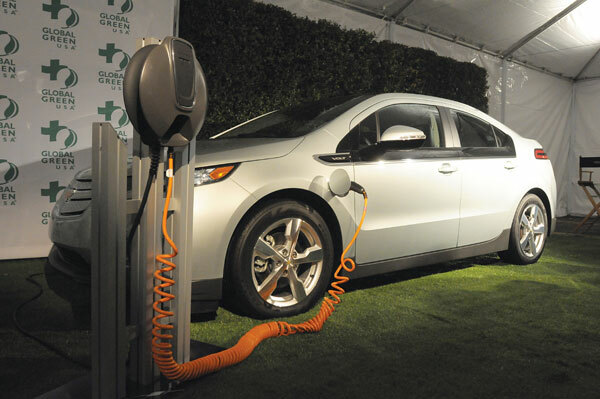 Car buyers may get sticker shock seeing the Chevy Volt’s $41,000 price tag given the electric vehicle’s limited range and capabilities, but the media went into shock after James Hohman, assistant director of fiscal policy, revealed in late December that each Volt sold so far costs taxpayers as much as $250,000. Hohman’s calculations are based on all of the subsidies, tax credits and corporate welfare associated with the Volt — about $3 billion total — in state and federal dollars. 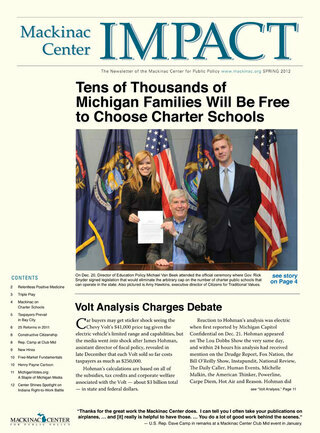 Reaction to Hohman’s analysis was electric when first reported by Michigan Capitol Confidential on Dec. 21. Hohman appeared on The Lou Dobbs Show the very same day, and within 24 hours his analysis had received mention on the Drudge Report, Fox Nation, the Bill O’Reilly Show, Instapundit, National Review, The Daily Caller, Human Events, Michelle Malkin, the American Thinker, Powerline, Carpe Diem, Hot Air and Reason. Hohman did additional interviews with Fox News and Fox Business News. Investor’s Business Daily, the American Spectator, The Pittsburgh Tribune Review, The New York Post, WOOD-TV in Grand Rapids, The New Jersey Star-Ledger and numerous other outlets also referenced his work. Hohman later penned a letter to the editor that appeared in The Washington Post about an editorial the newspaper had written on electric vehicle subsidies. “It would be better to let Americans’ green conscience guide their consumption decisions, instead of having Congress and the state legislatures make those decisions,” he wrote in The Post. Hohman said the idea to tally the Volt costs sprang from another project he was working on. GM sold about 7,600 Volts in 2011. U.S. Congressman Jim Jordan, an Ohio Republican, referenced Hohman’s study at the beginning of a House Government Oversight Committee hearing in late January on whether the government’s financial stake in GM played a role in how the National Highway Traffic Safety Administration handled results from crash tests.